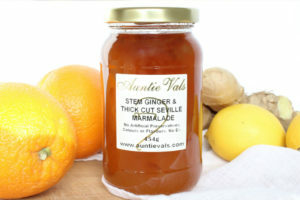 Auntie Val’s Ginger collection includes Chinese Stem Ginger in syrup from Fujian province, as well as favourites such as Root Ginger & Seville Orange Marmalade and Rhubarb & Ginger Jam. Stem Ginger in Whisky Syrup, Chinese Stem Ginger from Fujian Province with my special syrup and a dash of whisky. Orange Whisky & Ginger, our original Orange & Ginger we have slipped Whisky in as an extra special treat. 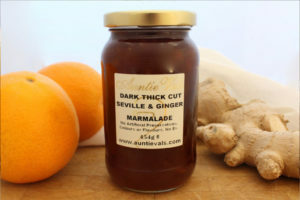 Dark Thick Cut Seville & Ginger,‘Oxford’ style Marmalade for those who prefer a richer flavour, with shreds of ‘Ginger’. Stem Ginger & Thick Cut Seville, with shreds of Stem Ginger to complement the Thick Cut Seville Orange. 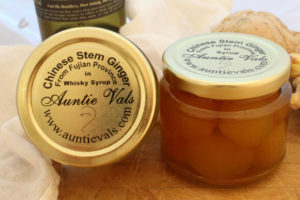 Stem Ginger in Syrup, scrumptious Ginger Balls in Auntie Val’s special Syrup! Crystallized Ginger, Gorgeous pieces of Crystallized Ginger, coated in Caster Sugar. Root Ginger & Seville Orange Marmalade, this is the Ginger lover’s breakfast treat! So versatile in the kitchen, check out my recipe page! 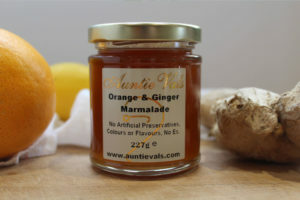 Orange & Ginger Marmalade, this is a favourite with so many customers, I could not leave it out of the collection! 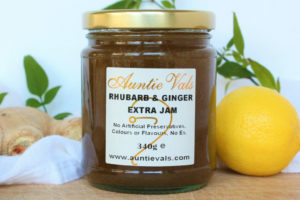 Rhubarb & Ginger Extra Jam, this is an old favourite, with many people! Seriously Ginger Jam, Now this is one of my new ones, if you love Ginger try this, that’s all I am going to say !